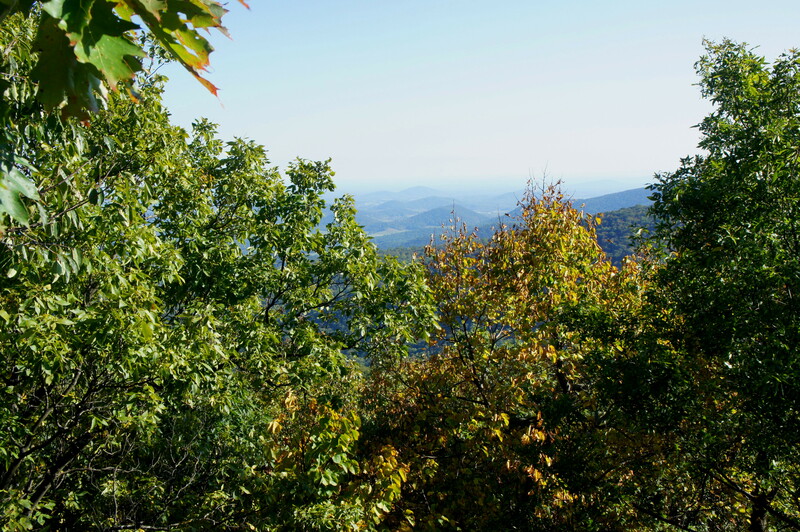 From the northern entrance of Virginia’s Shenandoah National Park, it takes more than 10 miles to clear Dickey Ridge and reach the “real” mountains of the Blue Ridge by car. 2,909-foot Compton Peak, situated 10.4 miles up Skyline Drive, is neither the park’s tallest promontory nor the prettiest, but it is the first of the high peaks, and the hike packs a lot into a short distance; just a 2.4-mile round-trip up the Appalachian Trail leads hikers to one tremendous viewpoint and a spectacular chunk of basaltic polygonal prisms, a geologist’s El Dorado. This moderate hike is both relatively convenient—the closest summit hike in Shenandoah to Washington, DC—and good for children, as the 500-foot ascent is short but gradual. 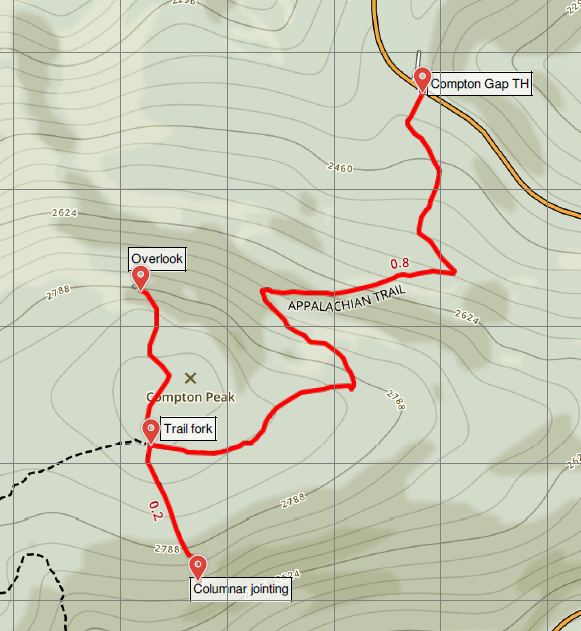 The Compton Peak out-and-back begins on the opposite side of Skyline Drive; look for a trail sign marking the southbound Appalachian Trail (AT). From the road, climb an initial set of stairs, then proceed up the gradually-sloping incline as the trail bends southeast. 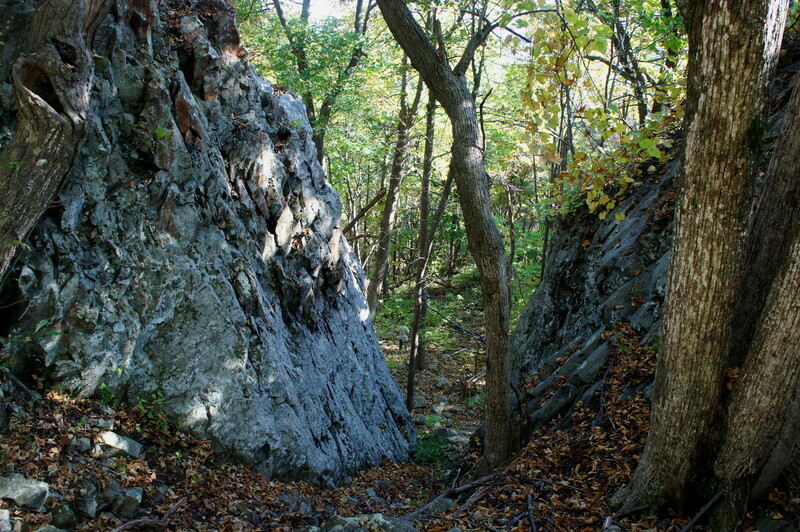 At 2/10 mile, the AT passes a gargantuan boulder on the left, a preview of the ubiquitous outcrops to come. 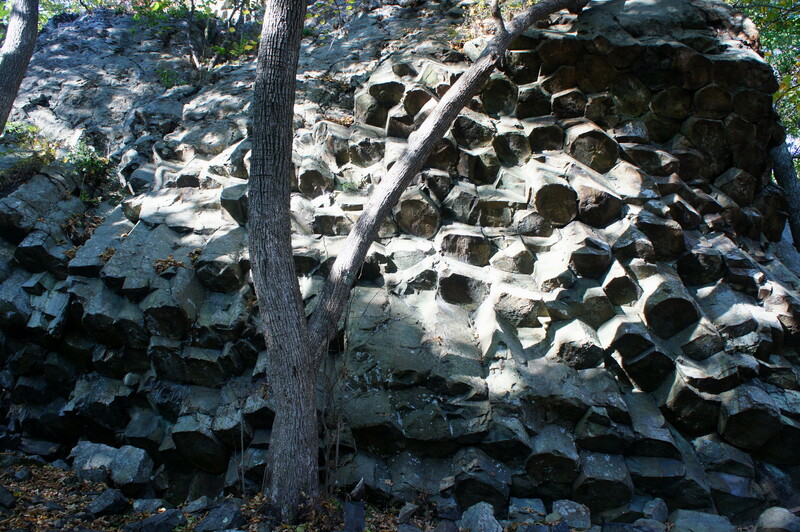 The most striking rock type in Shenandoah is greenstone, the product of ancient lava flows that have cooled and hardened into a firm ridgeline spanning from central Virginia to southern Pennsylvania. Composed mostly of basalt, the rock has taken on a greenish color over time as the rock metamorphosed under heat and pressure and mixed with a variety of colorful minerals. Rounding a right-hand bend, the trail bears west and the incline eases as hikers climb the slopes of Compton Peak. At 4/10 mile, the AT doubles back to the east then crests a ridgeline at just over ½ mile. From here the path briefly descends amid new growth forest then climbs again as hikers approach the summit from the south. A four-way junction is reached at 8/10 mile. While the AT continues straight to the west, the two spurs head north and south. Take a right first—you will return to this junction shortly—heading north toward the Compton Peak overlook. The spur trail climbs initially over rocky terrain to crest the high point of Compton Peak; at 2,909 feet, the summit itself is obscured by trees and offers no real views. From here the path descends for around 1/10 mile, reaching the impressive vista one mile from the trailhead. The overlook comprises a handful of exposed greenstone ledges and offers an excellent spot to take a break for lunch or a snack. 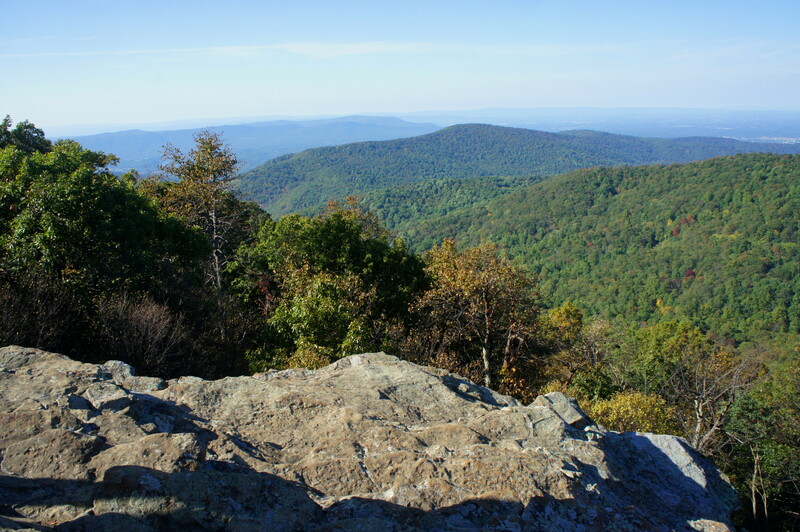 The relatively featureless bulge below is Carson Mountain (2,580’), the culmination of lengthy Dickey Ridge, which unfolds to the west, then bends north toward Front Royal, Virginia. Massanutten Mountain appears to the southwest, with Great North Mountain beyond on the horizon. Blue Ridge continues past Carson Mountain to the northeast, beyond the boundaries of the park. Having completed one of the two spurs, make your way southward back to the 4-way trail junction, cross the AT, and continue south on the second spur. 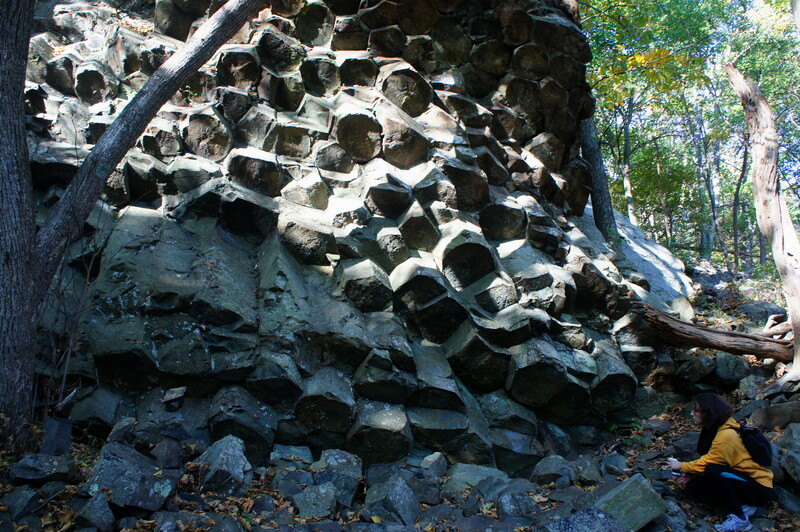 It is just under 2/10 mile from the junction to the park’s best exemplar of volcanic columnar jointing, a mosaic of metamorphosed basalt formed from lava flows around 800 million years ago. This geological feature is not at all obvious initially as hikers drop steeply down the hillside on the southbound spur. The steep path gives way to a set of rocky steps then reaches the topside of a large rock outcrop that offers an obscured and underwhelming view to the south. 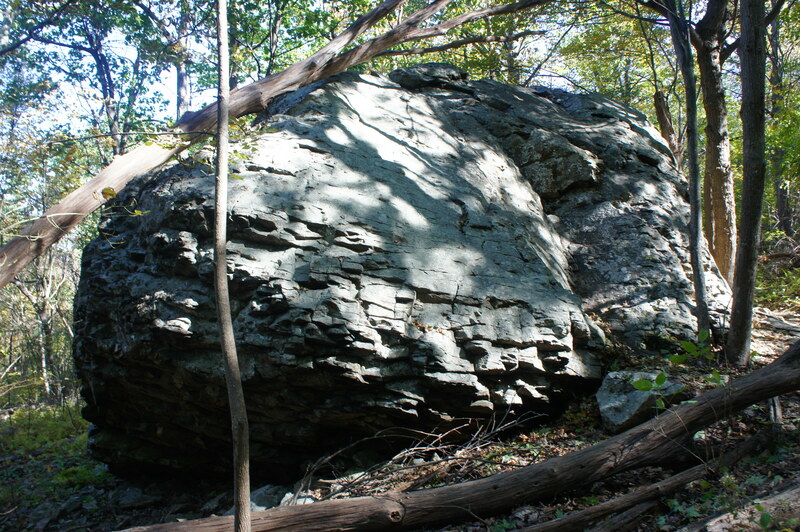 To the right, a narrow notch separates this large boulder from another of roughly equal size, making for an interesting picture. Continuing left around the outcrops, the trail drops to the base of the basalt formation, revealing the brilliant display of columnar jointing. 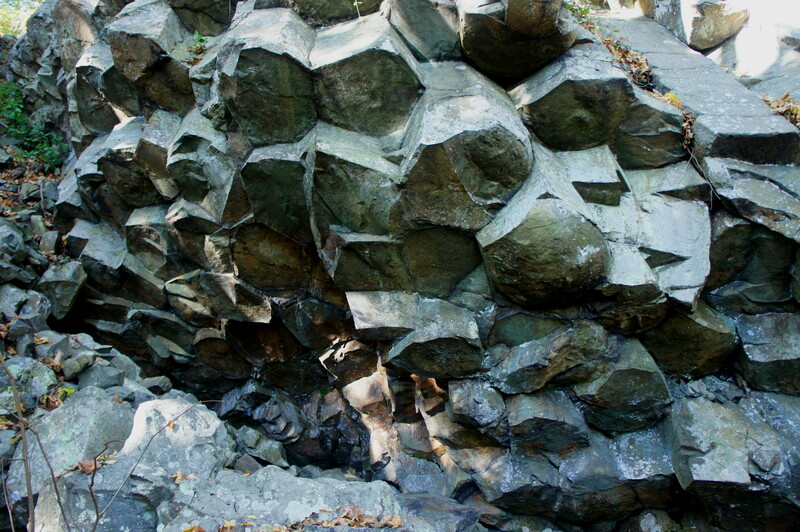 This feature, similar to the Giant’s Causeway in Northern Ireland, came about as exposed lava flows cooled very quickly, contracted, and lead to fracturing as the rock cracked into hexagonal joints, leaving behind basalt columns that were then tilted to their present angle by the thrust of the mountains. As this marks the end of the spur, return the way you came, reversing the sharp, 150-foot climb back to the trail junction. Take a right on the AT, descending leisurely for 8/10 mile back to the trailhead. Allot at least 1.5 hours for this round-trip hike to both spurs; the geology-minded will want to perhaps double that. 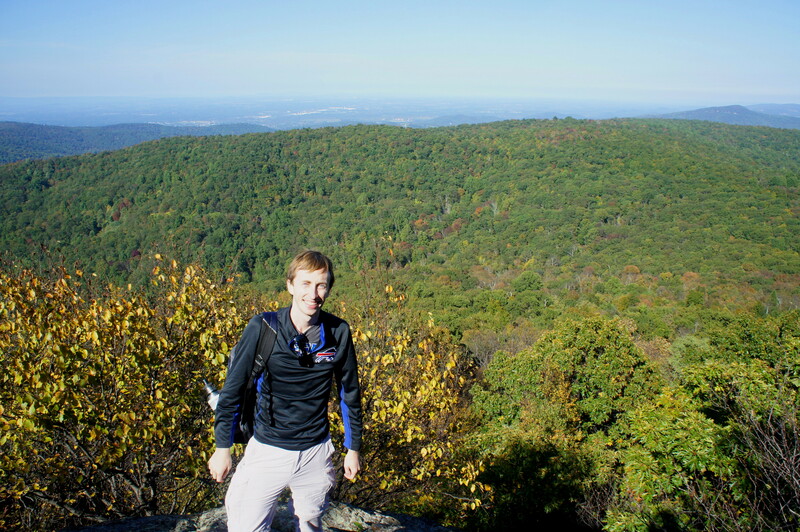 This entry was posted in Moderate Hikes, Shenandoah National Park, Virginia and tagged Appalachian Trail, basalt, columnar jointing, Compton Gap, Compton Peak, Shenandoah, Virginia. Bookmark the permalink.